One of our loyal customers has begun a business in the industry of building homes...tiny homes. These are about 200 square feet to 350 square feet and they are portable. These tiny homes are built on trailers and still include amenities we are used to such a restroom and a place for a queen size bed. They also have decent kitchens with capabilities of having a dishwasher, and a range. Our client created Uncharted Tiny Homes as a way for the yearly outdoors man to comfortably and cost effectively go on long camping trips or live off the grid for a while. However, these tiny homes are becoming so popular there are hundreds of people willing to live in a tiny home as opposed to a standard size house or apartment. 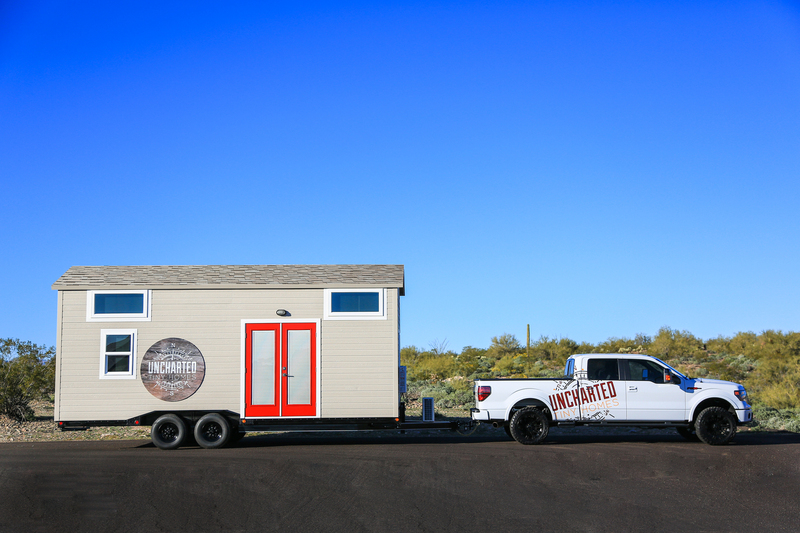 Here at Fast-Trac Designs we helped Uncharted Tiny Homes create a brand. Beginning with logo design, our artist kept in mind the name "uncharted" and going with a compass design truly portrays that the owner of a tiny home can go anywhere. This logo was then added to business cards which feature a worn wood background that will also match his store front graphics as well as apparel. The branding of a business is highly important in order to create a recognition with the general public, gain interest in the product and gain customers. Uncharted Tiny Homes has launched off as a success and the team at Fast-Trac Designs is excited to be a part of these tiny homes with big possibilities. For more information on logo design, graphics and apparel visit Fast-Trac Designs HERE. For more information on Uncharted Tiny Homes visit HERE. Are you in need of a party idea? Check out Epic Game Bus, just wrapped by Fast-Trac and ready for the road. You can gather up your buddies and cruise the town while playing you favorite video games. There are 5 big screen TVs inside the bus and when parked more friends can play outside on 2 more TVs! This bus is one of a kind and tons of fun for any party. The vehicle wrap done by Fast-Trac Designs includes all 3M wrap material including a translucent film that allows the window to glow color changing lights at night. Check out the Epic Game bus below! See their website for more info and for all vehicle wraps contact Fast-Trac Designs.